Papua New Guinea Governor General Sir Robert Dadae advised by Electoral Commissioner Patilias Gamato to invite the People's National Congress Party to form the next Government as the party with the highest number of seats won so far. The advice was given during the Return of 88 Writs with 23 seats yet to be declared. 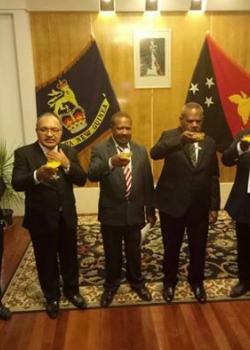 In response, Peter O’Neill accepted the invitation from Governor General Sir Robert Dadae, to form the new Government of Papua New Guinea. Prime Minister O’Neill said the magnitude of the task is great, and it is one with which he is familiar with a proven track-record of delivery. "The ongoing political stability of our country’s leadership will continue, we must maintain ongoing economic growth, continue to create jobs and to work with each Member to strengthen their communities through our ongoing rural programs. "Members of Government know that we have a proven our capability over the last term of Government. "We have delivered for our Nation, and we have delivered for Districts and Provinces around our country. "I will always maintain an open-door policy for all Members, where each representative can bring the concerns of their electorate directly to me and we work together. "We will not let our country’s development slip back to the days of the Somare and Morauta Governments where the former Prime Ministers were isolated from Members of Parliament. "The dysfunction of the Somare and Morauta years saw districts and provinces ignored, and services grinding to a halt because there was no commitment to local development. "We have turned this around and we have brought about positive change. "Through our core policies, and the devolution of authority, supported by District and Province Service Improvement Programs, Members are able to play an active role in service delivery and infrastructure development." The Prime Minister said the 2017 National Election has given the people of the Nation the opportunity to have their say on the Government they wish to lead the Nation for the next five years. “The people of Papua New Guinea have elected an overwhelming number of candidates from the People’s National Congress and our Coalition partners to lead our Nation. “We have lost some of our senior Members, and new Members have been elected in this process. That is the nature of elections, and while we thank the outgoing Members, it is also a reminder to all Members that they must work hard in their electorates if they wish to be re-elected. “Our Coalition Members will assemble in Parliament next week where we will present our majority to the Speaker and to the people of Papua New Guinea.